حدیدی, احسان, محقق, نادر. (1395). بررسی میزان تمایل به مصرف کالاهای داخلی مصرف کنندگان ایرانی از دیدگاه اقتصاد مقاومتی. سیاست‌های راهبردی و کلان, 4(ویژه نامه اقتصاد مقاومتی), 169-191. احسان حدیدی; نادر محقق. "بررسی میزان تمایل به مصرف کالاهای داخلی مصرف کنندگان ایرانی از دیدگاه اقتصاد مقاومتی". سیاست‌های راهبردی و کلان, 4, ویژه نامه اقتصاد مقاومتی, 1395, 169-191. حدیدی, احسان, محقق, نادر. (1395). 'بررسی میزان تمایل به مصرف کالاهای داخلی مصرف کنندگان ایرانی از دیدگاه اقتصاد مقاومتی', سیاست‌های راهبردی و کلان, 4(ویژه نامه اقتصاد مقاومتی), pp. 169-191. حدیدی, احسان, محقق, نادر. بررسی میزان تمایل به مصرف کالاهای داخلی مصرف کنندگان ایرانی از دیدگاه اقتصاد مقاومتی. سیاست‌های راهبردی و کلان, 1395; 4(ویژه نامه اقتصاد مقاومتی): 169-191. In the eighth paragraph of general resisting economy policies,“thepromotion of using the domestic commodities"has been underlined and the fifth capacity for executing this issue is considered dependent on “directing the domestic market towards national production and domestic production”. So being aware of the tendency rate to use the domestic commodities of Iranian consumers has an important role for economic planning in order to forecasting domestic production and consumption. In this study, for assessing “the tendency rate to use the domestic commodities” or “consumer nationalism”, an international scale namely CETSCALE have been used. 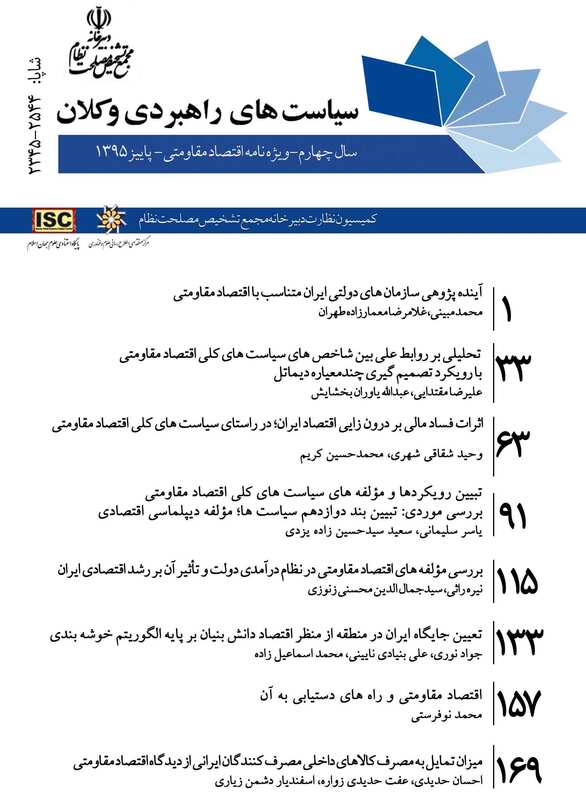 Then a sample of 261 consumers have been selected in Zavareh city and 17 first questions of thequestionnaire have been used to assess “consumer nationalism “. The results show that "consumer nationalism"in Zavareh city is above average with a number of 74/83 (minimum 17and maximum 119) and this city is classified in the category of cities with high degree of “consumer nationalism". The results showthat there is a good potential for the implementation of the eighth paragraph and also the fifth capacity of resisting economy inZavareh city. Therefore, similar studies are suggested in other cities of Iran to survey “consumer nationalism “in those cities.